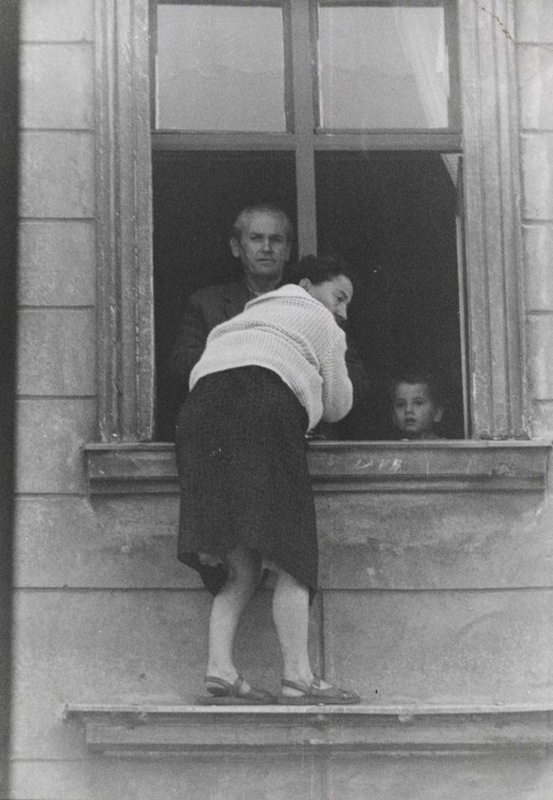 Four-year-old Michael Finder escaping communism from a window. October 7, 1961. 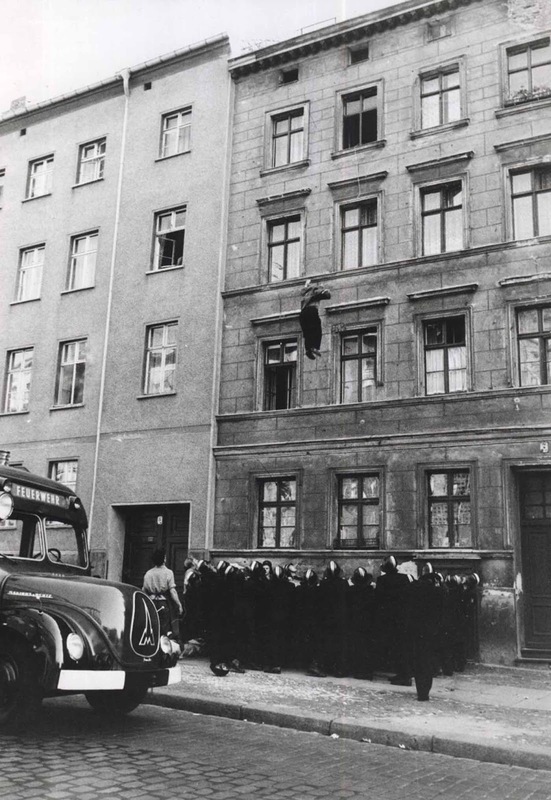 Four-year-old Michael Finder of East Germany is tossed by his father into a net held by residents and firemen across the border in West Berlin. The father, Willy Finder, then prepares to make the jump himself. Pictures taken from the booklet “A City Torn Apart: Building of the Berlin Wall”. These photographs are taken around the same time the Berlin Wall was being erected. The Soviet occupation zone in Germany (and Berlin) suffered from serious movements of educated individuals from their sectors toward the West throughout the 1950’s. This brain drain encouraged the Soviet Union to begin construction of a “Fascist Protection Wall” that would keep East Germans protected from “Fascism” that the Western Allies had “not eradicated in their sectors “. Of course, this wall was only really to keep East Germans from emigrating to the West. The wall later became the Berlin Wall. These apartments were along Bernauer Straße (Bernauer Street) in Berlin. A line which saddled the border between East and West Berlin. After the wall was first constructed in 1961, many escape attempts were made through these apartment blocks. So much so, that the Soviets had to brick up the windows and raid the apartments of the people who lived there. They evicted the people living in those apartments. So what we are seeing when these people are jumping from the 4th floor are the people who are making a last ditch attempt at the West before all their (relatively safe) options out of East Berlin were gone for good. The father, Willy Finder, jumping to the West Berlin. The mother was the first one to jump. In this picture you can also see Willy and the 4-year-old Michael. 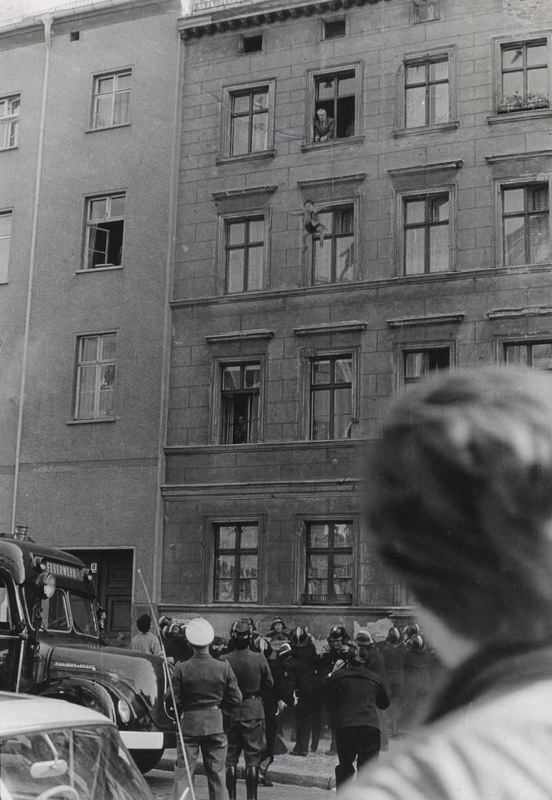 These apartments were later torn down and the Berlin Wall that most of us picture in the news reels, and have chunks of in our museums all over the world, was erected. Between 1945 and 1988, around 4 million East Germans migrated to the West. 3.454 million of them left between 1945 and the construction of the Berlin Wall in 1961. The great majority simply walked across the border or, after 1952, exited through West Berlin. After the border was fortified and the Berlin Wall was constructed, the number of illegal border crossings fell drastically. The numbers fell further as the border defenses were improved over the subsequent decades. In 1961, 8,507 people fled across the border, most of them through West Berlin. The construction of the Berlin Wall that year reduced the number of escapees by 75% to around 2,300 per annum for the rest of the decade. The Wall changed Berlin from being one of the easiest places to cross the border, from the East, to being one of the most difficult. (Photo credit: The Central Intelligence Agency).